This turned out to be the perfect NEW YEARS Breakfast, starting the new year right! Place Canadian bacon on bottom of a 6-oz. ramekin or custard cup coated with cooking spray. Pour egg substitute over top. Microwave, uncovered, on high for 30 seconds; stir. Microwave 15-30 seconds or until egg is almost set. Top with salsa; sprinkle with cheese. Microwave just until cheese is melted, about 10 seconds. Line bottom of English muffin with spinach. 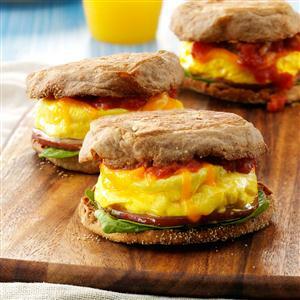 Place egg and Canadian bacon over spinach; replace English muffin top. Yield: 1 serving.